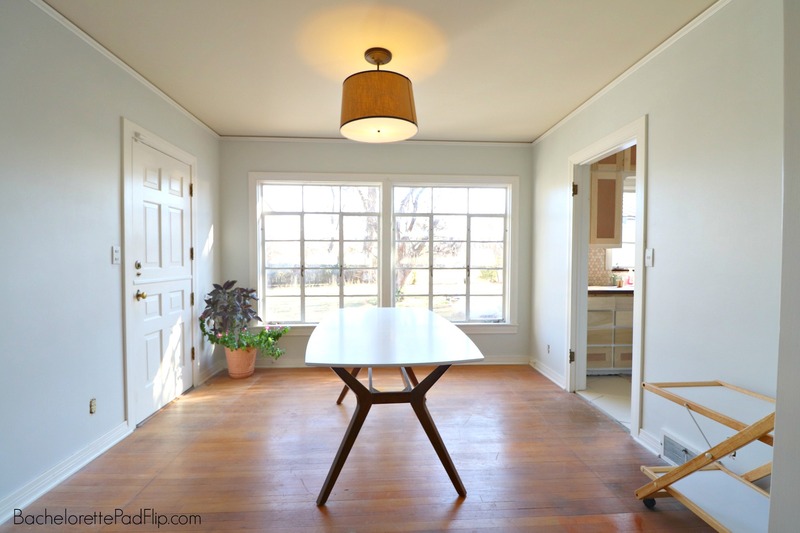 The dining room at Flip 5 was really a show stopper even in its original state. The main contributing factor was the huge original windows that flooded the space with natural light. 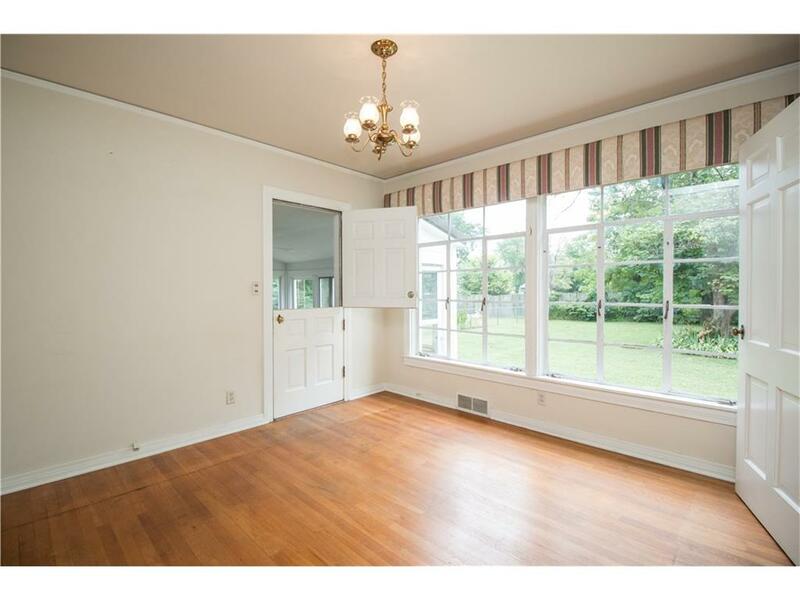 It’s also conveniently located between the kitchen and dining room, and it had ample space. I had really good bones to work with. Much like the master bedroom at Flip 5, it really only needed some tiny changes and the magic of staging. The dutch door to the sunroom was an obvious charming accent not seen in many modern homes, and I know it adds tremendous sell-ability to the home. The other door is part of the dated design of doors to each room- including the kitchen. Today’s home owners and buyers want as open concept as possible, so that dated design had to change…but it was as simple as taking the door off the hinges. The dated cornice board and old light fixture needed to go, but that was really the extent of changes I had planned for this space. Eventually I’ll have the floors restored, but, for now, they’re staying in their original condition. The cornice board was removed in about 5 minutes, and my brother-in-law swapped out the old light for a vintage inspired one I thrifted for $15. As with the master bedroom, the walls got a fresh coat of my favorite gray paint. I mentioned that I always have a staple piece that I start with and then work around it. 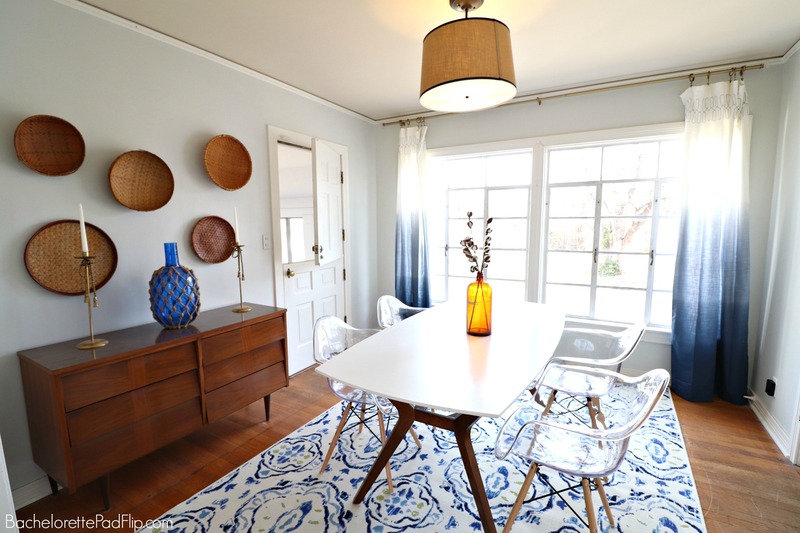 For this room, the staple piece is a beautiful midcentury inspired table I scored for less than $200 at Target. I made the rest of my design work around that table. I found a midcentury dresser on Facebook for $175. It came with the original mirror that I didn’t plan to use (maybe I’ll find a place for it elsewhere). It was in really great shape, and even though its original function was a dresser, I decided to use it as a buffet in the dining room. 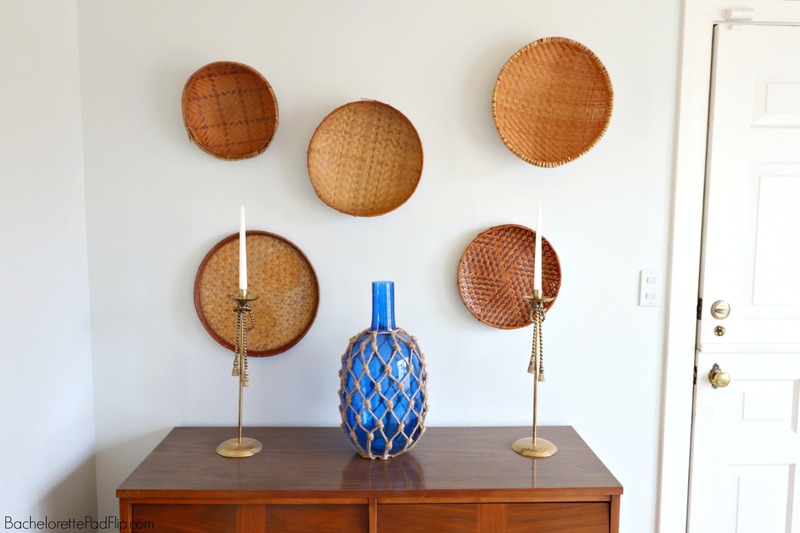 My next design choice was to create a basket wall. This was such an easy and very affordable project! I picked up several at thrift stores and spent a total of $6! I stumbled on the matching brass candlesticks for $1 at a thrift store and added some 50 cent tapers. My last little accent in this corner was a clearance find from Cracker Barrel– it was only $8! Tip: When you’re living in or designing a small space that is lacking storage, get creative! This dresser provides ample storage for linens, office supplies, shipping supplies, and I keep some art supplies in there too. Flip 5 does not have good storage, so I have to get creative! 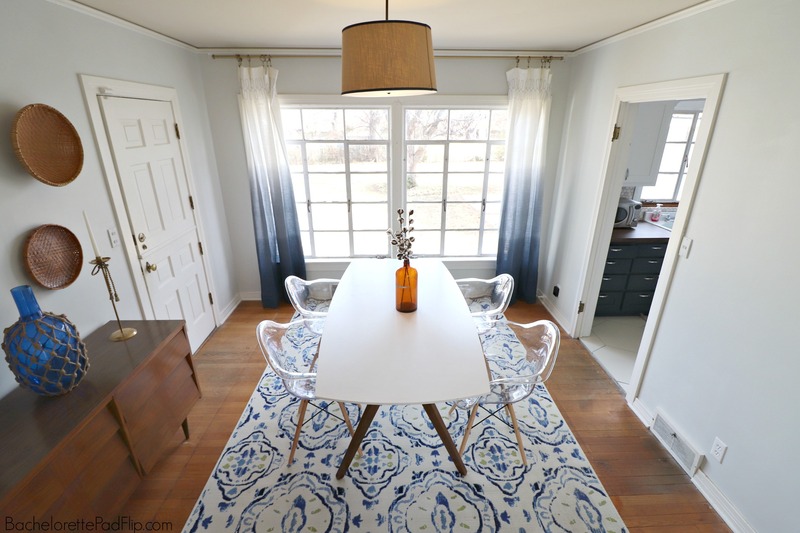 I knew that I wanted deep blue to be the primary color in this room because it would segway to the navy I was using in the kitchen and would match the trim accent on the thrifted light. 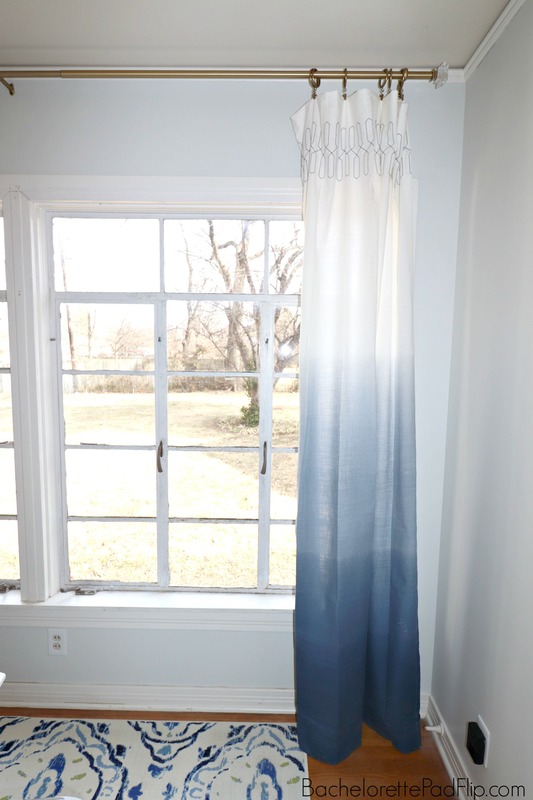 But navy can be overpowering, so I loved when I found blue ombre embroidered curtains at Target. They provided the pop of color I needed, but in a softer manner. Throughout the entire home, I have been incorporating brass. With its original vintage charm and yet modern appeal, I thought brass accents were the perfect choice for this midcentury home. Surprisingly, very few stores carry brass curtain rods. Since brass is back, I was shocked! Not even Target had decent ones. So I ended up purchasing these brass & lucite rods at Bed Bath and Beyond and getting the matching brass curtain rings. The curtains were longer than standard which means that I got to hang the rod higher than the window height– which I love when I get to do that! 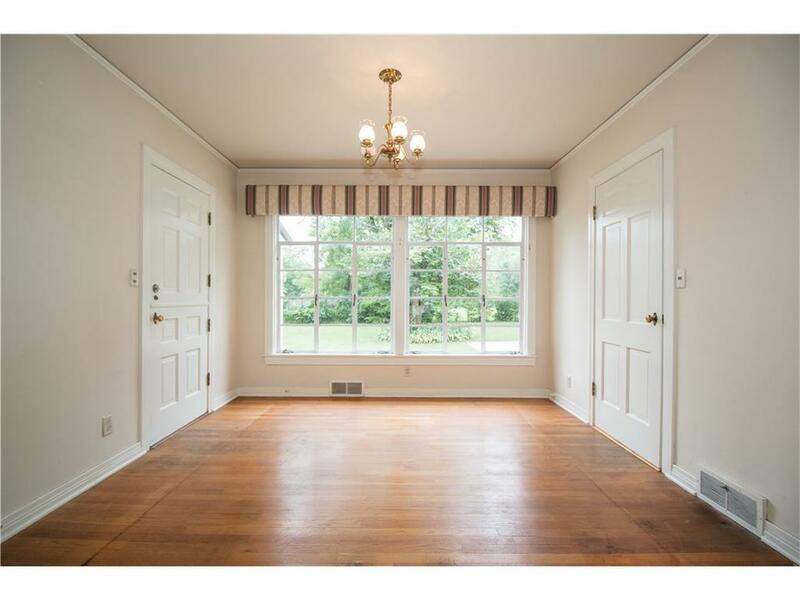 The windows were the show stopper in this room anyway, so why not make them more grand? Isn’t that rug phenomenal? The shades of blue really pair well with the ombre curtains. And guess how much I paid for it! A brand new, 9×12 area rug in the exact color I needed….for $20! Originally this rug was $200, but I just so happened to catch the Target clearance at the right time! For dining chairs, I really considered creating benches with hairpin legs, but I felt like most midcentury tables didn’t have benches. I had two lucite chairs that I picked up at an estate sale for $35, and I found two more matching ones at Hobby Lobby (not for $35….). Even though the wood grains don’t match the table, I kind of like the eclectic style it brings to the space. I’m usually not a huge fan of centerpieces on tables– I’m weird. But I think it’s a great way to add some vertical elements to a space. 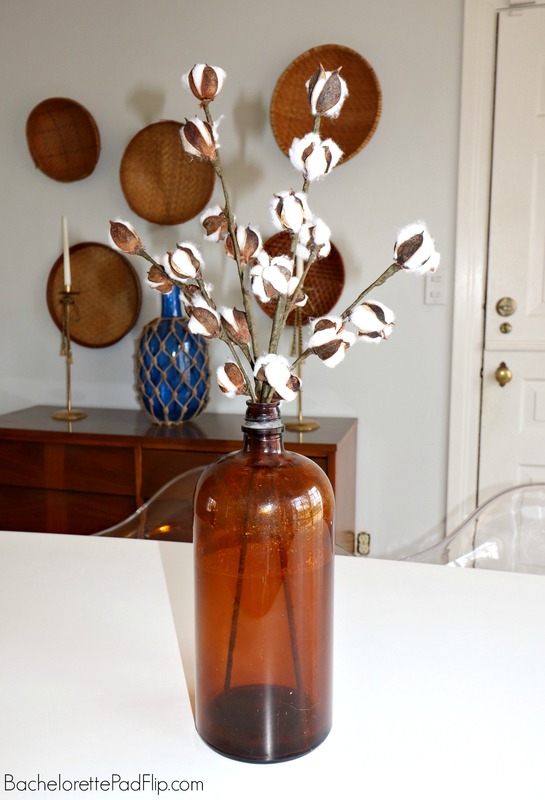 I purchased this amber jug years ago for $1, and its color really pairs well with the wood grain color in the table legs and dresser. I picked up two cotton stems at Hobby Lobby to create a very simple centerpiece. One of my design rules is to pick a color and stick with it throughout the entire house. For Flip 3 it was turquoise. For Flip 5, I’m using blue throughout. The master bedroom used softer shades of blue, but in this room with so much natural light, I felt braver using bolder shades. That’s something else I love about the gray I used on the walls- it coordinates well with blue and can even appear to have slight hints of blue in certain light. I’ll eventually set up a bar cart area in this room too, but I’m attempting to DIY that and it’s not ready yet. Bar carts are all the rage right now, and it’s another way to add fun design through the barware and decanters. I’m a firm believer in the power of staging. This room was a blank space- it just needed some definition. Given the right accents, any room can shine– whether it’s for your own enjoyment or for future buyers. 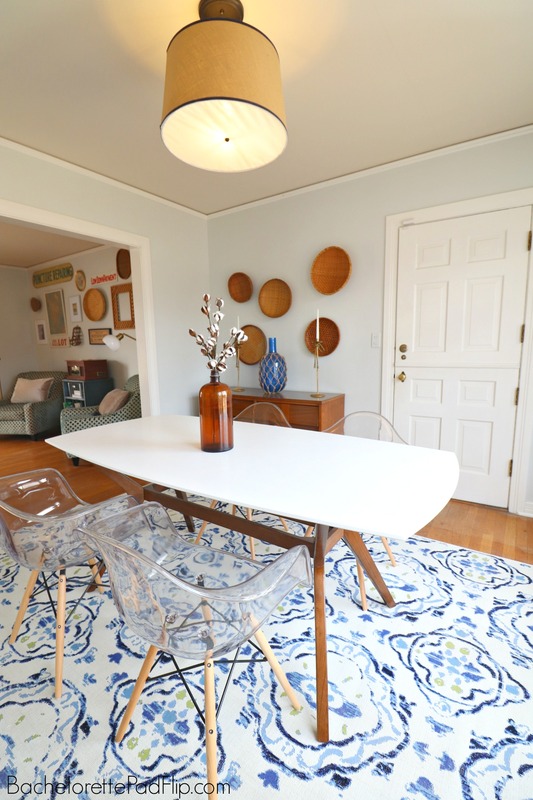 Staging can be simple or dramatic, but keeping a cohesive design that mimics the integrity of the home really paints the full picture for buyers as they tour a home. The purpose of staging is to make buyers want to stay in that room and see themselves living in that room– I want buyers to imagine fun dinner parties and after hour cocktail chats sitting around the table. I love when I get to express some personality in a room, and this room did just that! Beautiful room, and love the color aesthetic and clean lines! Just wanted to ask, for the door frame to the kitchen where you removed the door, did you also remove all the hardware and refinish the trim? Blue and brass is a favorite combo of mine. 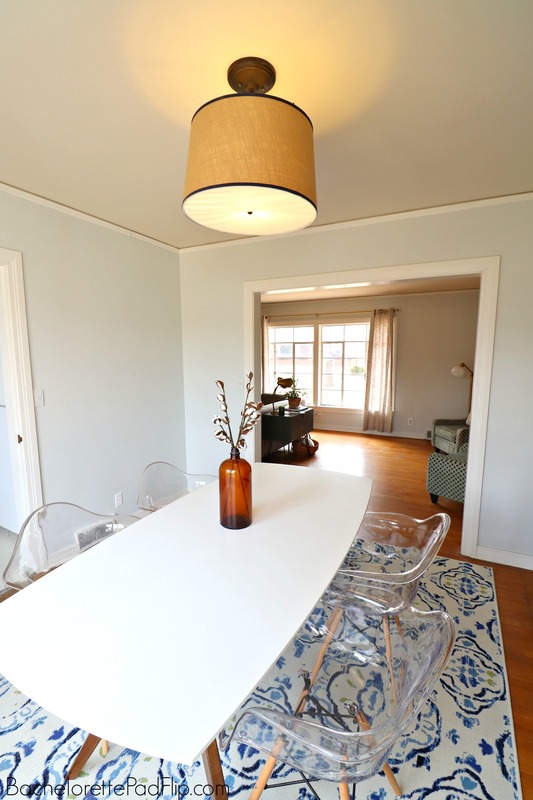 The chairs are perfect to see down to the rug and open up the space. I love it all. Room looks GREAT ! Love the navy accents.